A new variable type, the Part-Filter Variable (PFV), is being used to track a filtered group of Transparts on the order. The PFV provides the data store for the parts in a Part Filter Grid (PFGrid) and access to those parts with CFL. The Part-Filter Variable (PFV) is a central object that encapsulates the transpart-filtering functionality. It derives from a variable, but consists of additional properties and sub-objects that manage the transpart collection. In the product setup, a unique PFV must be added for each collection of Transparts on a line item. A single product may have several PFVs, each providing filtering on different criteria (e.g, one for shirts, one for hats, one for hoodies, etc.). The Part Filter Grid pulls its underlying data from the PFV. Unlike other variables, the PFV data is not saved. It is reloaded and recomputed any time the order or estimate is edited, cloned, or converted. 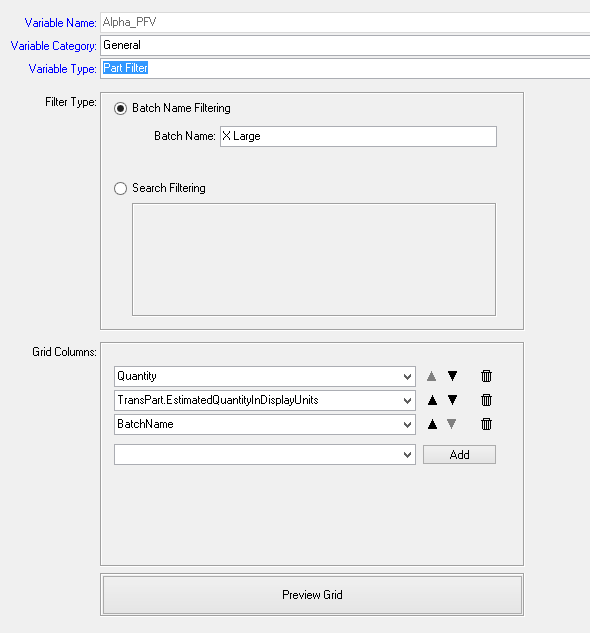 Batch Name Filtering. The Batch Name filter limits the PFGrid to only show only parts with a specific batch name. Part Search Filtering. The Part Search filter limits the PFGrid to only show parts that match all filters. The Grid Columns function identically to the Smart Part Search Variable's grid column setup. When Search Filtering is active, the values are set just like the Smart Part Search Variable's Fixed Search setup. The Part Filter Grid component (PFGrid) is an intelligent grid for displaying parts that are already on an order (TransParts) on a pricing form. 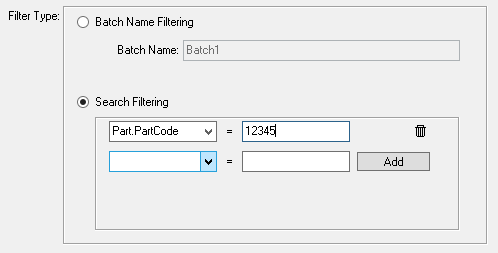 The Part Filter Grid displays the parts on an order as filtered by either the Batch Name or the Search Filtering as set by the Part Filter Variable. Quantity used for the order. Batch Name of the part. Unit Cost and ExtendedCost of the part. Unit Price and Extended Price of the part. These fields are only valid if parts-based-pricing is used for the product.